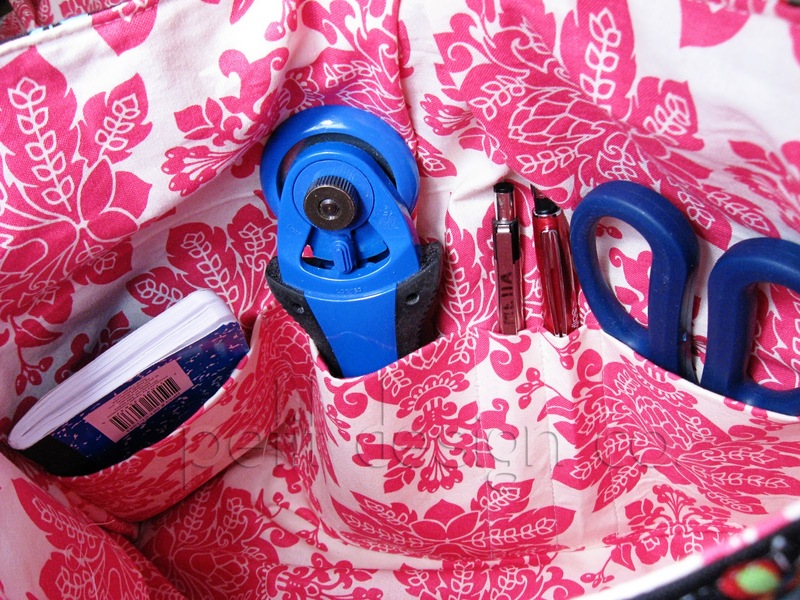 Petit Design Co. is joining in all of the fun of Sew Mama Sew's Giveaway Day. Make sure you hop on over to view the 3 master lists (yes 3!) of everyone joining in for the fun giveaways. If you don't win you are more than welcome to purchase your own silhouettes which make great presents for Mom's and Grandparents. Just hop on over to my store over there on the left. Keep in mind that I'm only taking Christmas orders until the 17th. Isn't it cute? 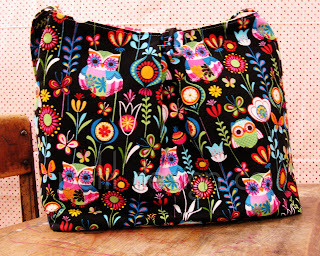 You can head over to my other blog Quilty Giveaways for the pattern review and a chance to win a bag pattern of your choice. My favorite Christmas decoration is a wooden Santa I bought when visiting my parents up in CANADA! He has birds perched on him and such a happy jolly grin. K. Make me a winner! My favorite Christmas decoration is the stuffed monkey my daughter decided needed to top the tree along with the star every year. My fave are the watercolor paper snowflakes that I make with my daughter every year. We hang them in our front windows. It's so much fun to see how much more sophisticated they get as she gets older. my favorite decoration would be the photo frame ornaments that we have for each kid for each year - they think they'll be taking these ornaments with them when they leave home, but they are so wrong - i love them too much! Gosh I would so love one of my boy!!! The tree of course! :) Thanks! The wreath because you can create a wreath out of almost anything! My favorite Christmas decoration is a scented gingerbread man (made out of plastic or wax??) that my mom had. Some of us tried to eat it when we were little--it smelled that good! My favorite Christmas Decoration is my Pug Christmas Tree...a silver tree laden with all my Pug themed ornaments! I'd have a hard time choosing which child but I'll throw my name in the hat anyway. OK, favorite decoration? Hand blown glass ornaments. To pick a favorite ornament would be very difficult, but I do collect nativity/creche scenes from around the world (I still only have a small collection currently, would love to expand). Thanks for the sweet giveaway! Hello! My favorite Christmas decoration is a ceramic tree with lights that I've had since I was four. I am now in my cough cough mid-thirties, and this tree has been with me for every Christmas. My favorite decorations are some plaster ones my mom painted a long time ago. She painted many, but there are 2 that I absolutely love. Since she passed long ago, I cherish looking at them every Christmas and place them on the tree in a prominent spot so I know just where to see them. Love the giveaway, I've done some silhouttes, but they are never as good as yours! My favorites are the ones from when I was a kid, a new one each year. If I had to pick just one, it would be the angel with my name on it. thanks for the chance! my fav Christmas decorations are the handknit stockings my mom made us. What a fabulous prize! My favorite decoration is snowflakes, but it can quickly change if I win me some sihlouettes! Thanks for the chance! Definitely Christmas trees. I've always loved them. How neat! I've always loved the kids silhouettes! Thanks for the chance to win! And my favorite Christmas decoration right now is the new advent calendar buckets I just bought this year. They are very nice galvanized buckets with the date on them and little pieces of fabric to hide a prize under. It looks very nice hanging from my mantel! My favorite Christmas decoration is the nativity we set up at church. Finally on Christmas eve at the late night service the baby is put in the manger. My Favorite x-mas decor is our tree. Its a sweet white vintage one made right here in Chicago - it looks so pretty with all the old beaded/pinned/sequins type vintage ornaments. lol. I made some unique ones this year from tufts of rabbit fur and loops of beads. thanks for the giveaway! My favorite decoration this year is sparkly snow flakes. We don't get real snow, so I like to decorate with pretend snow flakes. I've just started collecting small Christmas trees for my mantle. I have one that looks like it's made of candy canes and I love it! I think my favorite decoration is a tiny nativity scene I bought from a street vendor. Made of leaves and beans and such. What a lovely giveaway. Thank you!! My favorite Christmas decoration is my Nativity Scene. It reminds me of the reason for the season. My favorite holiday decoration is my replica leg lamp from the Christmas Story movie! I love it sooo much that I never take it down, tacky, but hey, I love it! My favorite decoration is a little manger with the words, "each of us is an innkeeper who decides if there is room enough for Jesus"
Definitely the nativity. It is a great reminder, and I always remember how magical it was growing up. My favorite decoration is actually my newest purchase! It is a snowflake mobile! I love it so shiny and cute! My favorite Christmas decoration is definitely a fresh Christmas tree. There is nothing like the smell, the lights, and all the different ornaments that each have their own memory. Your work is beautiful. Thanks for letting me enter! We don't celebrate Christmas, however I enjoy all the lights that are put up. I LOVE silhouettes!! and yours are lovely. My favorite holiday decoration is our mantle full of stockings. My favorite Christmas decoration is the beautiful Lenox ornament we bought the year we got married (2000) and I would normally never spend $50 for an ornament but it looks so lovely and reminds me of our first Christmas together as a married couple. Lovely silhouettes. I think my favorite ornament is one I actually just got at an antique store on sale. It is a sand dollar with a hand painted manatee in a christmas hat and holly. Odd, but I love it. i really enjoy the lights in our neighborhood, and around town, at christmastime. My favorite holiday decoration is an old music box that once belonged to my aunt. It brings back so many wonderful memories of when I was little and my cousins and I would get together for CHristmas. There was so much excitement. The music box still works and is fun to listen to. My favourite decoration is a ceramic tree lamp. As a child I was entranced by it, and when my grandmother passed away I was lucky enough to get it. The knit stockings made by my great-aunt! My favorite christmas ornament isa crocheted snowman that my grandma gave my mom her first christmas out of the house and now my mom gave to me!! My favorite Christmas decoration is my large, wooden advent calender. I've been wanting silouettes of my children! Fave decor...that's a hard one. I'm 36 weeks pregnant and finding it very hard to get into the decorating frame of mind this year! Wow! What a neat prize! And favourite Christmas decoration - candy canes on the Christmas tree - definitely! Candles and candles , everywhere candles. Very pretty! I like from your shop the couple with the umbrella :D Very pretty! My favorite Christmas decoration is my OSU Buckeyes wreath! My favorite Christmas decoration is my mittens-and-stocking advent garland. First, you are funny. Second, OMG! I want this soooo bad. I have been wanting a silhouette of my children before they get too big! My favorite Christmas decoration are the snowflakes my kids made out of popsicle sticks and glitter. One of my favorite decorations is a checkerboard I painted with a santa theme many, many years ago. I took a class with my mom, so it is special for that memory of creating alongside her. It is now extra-special, because I get to play checkers with my daughter at Christmas! My fave Christmas decorations are the ones with the year of my childrens' births from Hallmark. Love them! My favorite decoration is the bird nest with two little eggs & a mama bird that my mom gave me after I got divorced. My favorite is the Angel that used to be on top of my mothers tree. My favorite Christmas decorations are the stockings my husband and I embroidered our first Christmas together. I made his and he made mine - they look very rustic but are so sweet! My favorite is a replica of my wedding dress. I like a simple wreath that smells delicious! I have a silly felt tree-slash-candy-cane-holder that has little green frog feet. I'm Christmas crazy (and everyone knows it!) so my whole tree is filled with stunning decorations that have been bought by beautiful friends and family... impossible to pick just one! Would love a chance to win a silhouette - they are gorgeous! What an extremely nice present this would make - so glad to learn about your shop! My favorite holiday decoration is newly chosen - I've just finished an Advent/Christmas countdown calendar for my daughter. I tried to be seasonal and match her interests, which resulted in the usual symbols plus a Ms. Pacman, Sue the orange ghost and a tea cup. my favorite ornaments are my henry viii and his wives. i love pulling out the snowman collection! This is a fun giveaway! Would love to get silhouettes of me and my husband. Oh, I want to win so badly! I have "making silhouettes" on my list since ... well LONG ... but it does not seem to happen. I also have never done it, so they would be nowhere near half as pretty as yours!!!! I love silhouettes of all kinds! What a lovely giveaway! Wow, those silhouette portraits are AMAZING!!!! Amazing. Thanks for the generous giveaway! My favorite Christmas decoration are my kids' ornaments...I get them each one every year from Hallmark, an ornament that suits them. Thanks for the giveaway! I'd love to win. My favorite decoration is this little glass snowman ornament. Great giveaway! My favorite holiday decoration is bows, we have red and gold ones all over our tree. :) Thanks for the chance to win! I love our stockings! This is the first year we all three have them. My favorite decoration is my nativity set. I love it! Thanks for the chance! my favorite decoration is our tree! My favorite decoration are the ones my children made in K and 1st grade. Your giveaway will be a perfect gift of my new grandson. My favorite decoration is our pathetic, funny little tree. We live in a tiny apartment with two toddlers. A big tree just isn't practical. So, we got a 3 footer. But, there's not place to put it! So, we put it on top of the portable dishwasher. But, our kitchen is too small to keep the dishwasher in there -- so it sits in the living room. When it's time to wash dishes, we have to unplug the tree and roll the dishwasher/tree into the kitchen and hook it up. It never fails to make me laugh to see our wobbly fake little tree roll into the kitchen to wash up. Hah! My favorite decoration is the paper snowflakes my children just hung up all over. We don't get real snow here, but these are beautiful. My fav Christmas decoration is a little clay one my son made when he was about 4.
hi! i love love love your silhouettes! wow! i keep an ornment collection so each year i try to have one new ornment and tht's usually my favourite one (until the next year). i've been in your other blog, loved your bag by the way! My favourite one is a wooden Santa on sleighs, hand-painted! Tks fr this great chance! I love our tree, its always my favorite. please take a peek at my giveaway, if you get the chance..
My favorite decoration was a centerpiece my son JOE made in HS. Thank you for the wonderful giveaway and Merry Christmas to you. My favourite Christmas decoration is the angel on top of my tree.